Thousands have rallied worldwide to celebrate International Workers' Day or May Day, the largest labor holiday in the world. In some countries demonstrations have turned violent with police deploying tears gas. Several hundred people took to the streets in Istanbul with police using tear gas and rubber bullets to disperse protesters at the landmark Taksim Square, the Hurriyet Daily reported. Some 10,000 officers were on patrol in the area. At least five people were detained in the Okmeydanı neighborhood of Istanbul after being found in possession of gas masks and marbles. Also two women were arrested at Taksim Square when they attempted to unfurl a banner. Some people were shouting "Long Live May 1!" and "shoulder to shoulder against Fascism!" Turkish Prime Minister Ahmet Davutoglu earlier said only “symbolic” rallies are allowed and any attempt to stage mass demos will be blocked. In Ukraine, about a thousand supporters of the Communist Party gathered in Kiev despite the authorities banning May Day demonstrations with Communist flags in the center of the city, RIA Novosti reported. People have been protesting against the rise in prices and government policies, and say they want peace in the country. During the rally the leader of the Communist Party, Petr Simonenko, accused the Kiev authorities of “anti-popular policies,” price hikes and chronic unemployment in Ukrainian. “Ukrainian issues are not decided in Kiev now. It is either Brussels, or Washington, or other European capitals,” he said, adding he wants all Ukrainian problems solved in Kiev again. Police said they have arrested 19 radicals in balaclavas, who attempted to break into the rally and started scuffling with law enforcers. Massive May Day rallies have also descended on the streets of London. The march, organized mainly by trade unions and other London-based workers’ communities, started at Clerkenwell Green and continued to Trafalgar Square. One million Cubans are demonstrating on Havana´s Revolution Square, local press reported. The Cuban Worker´s Confederation said the rally will reaffirm the people´s determination to keep fighting for socialism. Thousands of workers have staged demonstrations in Athens, Greece. The rally was held amid a train and tram drivers’ strike, which was disrupting the capital’s metro and national rail services. Labor Day rallies in the US are focusing on police brutality in the wake of a series of black men’s’ deaths after encounters with officers of the law. "It is important to support movements and struggles that stand up for people being singled out by the system. Right now, immigrants share that distinction with African-American youth - that we are being targeted by the system," said Miguel Paredes, membership coordinator of the Coalition for Humane Immigrant Rights of Los Angeles. However, some marches will stick with tradition and concentrate on labor and immigration issues. 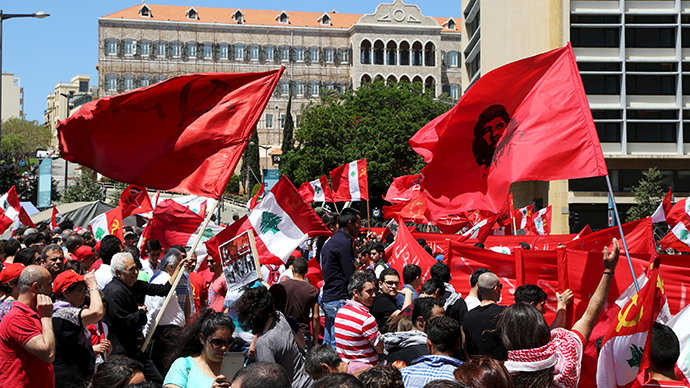 May Day marches have also swept Asia, the Middle East and Europe. About 20,000 people have taken to the streets of Milan in a May Day demonstration dubbed “No Expo May Day Parade”. The parade coincided with the opening of the Expo 2015 Universal Exposition. Opponents of Expo 2015 have accused the authorities of wasting public funds by hosting the show as the country plunges deeper into crisis.